Part of the Malaysian innovation is in gastronomy. 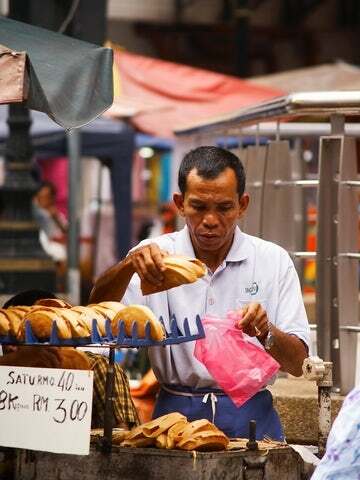 The country's chefs have mastered the techniques of cooking started by their forefathers and have put in their own westernized education to come up with the best Malaysian cuisines. This is the reason why today we are studying its top 5 dishes as espoused below. It seems that the tenacity of Dr. Mahathir Mohamed, the former Malaysian Prime Minister has more than paid off. Malaysia is just a few more years away from acquiring the status of a developed nation, its tourism sector is booming and the Malaysians have never been more innovative. This Malaysian delicacy is yet to get the global recognition that it deserves, but a taste of the food will take your taste buds on a whirlwind. It is a pancake that is packaged omelet style with just the right mix of sugar, peanuts and corn. This dish has its roots in the Kerantan region in the northern Malaysian Peninsula. It is an eye-catching delicacy due to its blue color. The rice floor is mixed with crushed telang flowers to make the blue color. It is served with fermented fish soup, bean sprouts and fried coconut. This is a Malaysian staple that consists of barbecued chicken that is slathered in coconut milk, spicy chili and garlic. Do not be surprised by the long lines of hungry patrons that await being served. Join the lines and you will soon find out why Ayam Percik is so popular. This sounds like something out of Hollywood, but it is not. It is a slim bread that is used to make sandwiches out of minced meat, eggs, and a host of condiments including Mayonnaise, ketchup, barbecue and chili sauce. Taste this and maybe you will lose that addiction of burgers that you have had since your high school days. This is a pastry dish that is done Malay-style. They are small sugary morsels that will have you hooked from the first time you sample them. The only downer is that it is ridiculously small. Global recognition or not, Malaysian cuisine is here to stay. It maybe underrated, but only by those who have not had a chance to sample the above dishes. If you are touring Malaysia and are yet to sample the above dishes, you are making the same mistake the globe has made. Malaysian cuisine is the best kept secret!